Aluminum Siding - Ace Steel & Recycling Inc.
Have you re-sided your home lately, or replaced your aluminum gutters? 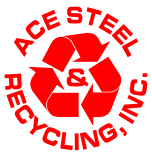 Why haul old aluminum siding or gutters to the landfill when Ace will pay you for them! You'll get paid more per pound if you can remove all other materials, including steel screws, from the siding or gutters, but we'll take them any way you want to bring them in. You'll drop your product off at the dock in front of our building, where our staff will weigh it to provide you with a ticket to redeem at the front desk. Ace makes it quick and easy to turn trash into cash! If you have questions or concerns, feel free to call us at 342-8649. We're open weekdays 8-5, and Saturdays 8- noon, and we to earn your business!